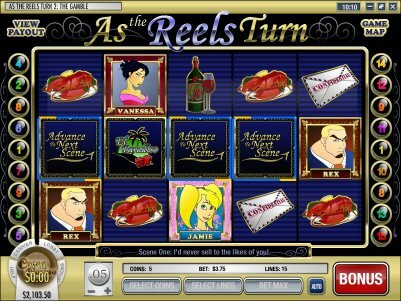 Overview: As the Reels Turn 2: The Gamble is a five reel slot with a story - the more you play the more of the story you see. There are five scenes in this episode. You start by recapping the last episode and then you begin playing the slot. When three or more 'Advance to Next Scene' symbols appear on the reels the next scene will begin. After each scene you are brought back to the game to continue your play. You can replay past scenes at any time by going to the Game Map which you acess by clicking 'Game Map' in the upper-right corner of the game. Click on any scene and it will replay for you. There are four Scatter Icons in As the Reels Turn: The Danny Icon, Ivan the Fish Icon, Bonus Icon and the Advance to Next Scene Icon. 3 or more of these Icons will need to appear anywhere on the five Reels to trigger their Bonus Round. The Icons do not have to appear on any single payline. Danny Bonus Round: If 3 or more Danny Icons appear on any of the 5 Reels, including paylines that are not enabled, you will enter the Danny Bonus Round. In the Danny bonus round you must choose a Danny character that you think the audience will like the most. 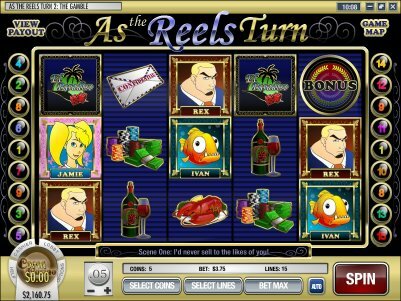 Ivan the Fish Bonus Round: If 3 or more Ivan the Fish Icons appear on any of the 5 Reels, including paylines that are not enabled, you will receive 10 Free Spin at 3 times Multiplier. The Free Spins will be worth the same value per spin as the original spin that triggered the Free Spins. Counterfeit Chips Bonus Round: If 3 or more Bonus Icons appear on any of the 5 Reels, including paylines that are not enabled, you will enter the Counterfeit Chips Bonus Round. In this Bonus Round you will click on the different Casino Chips until you hit a Stop Chip. The values of the winning chips will accumulate for a final payout. 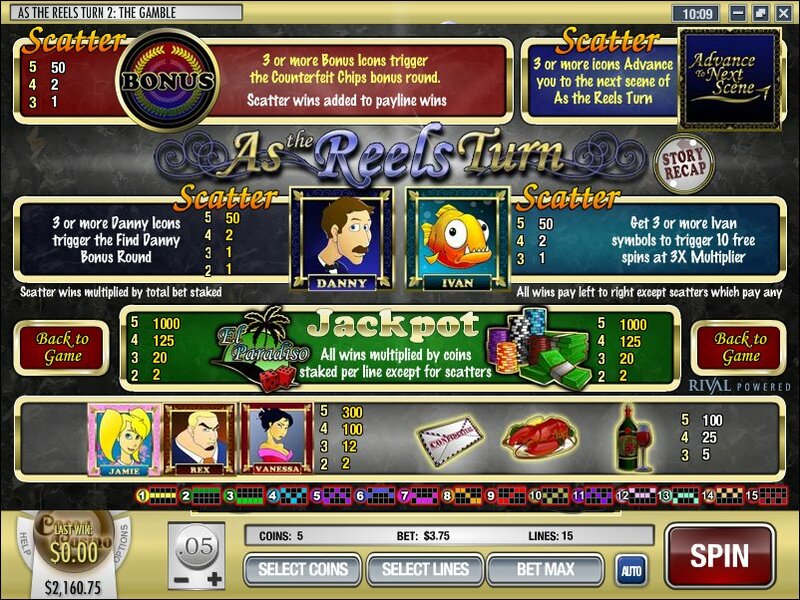 Advance to Next Scene Bonus Round: If 3 or more Advance to Next Scene Icons appear on any of the 5 Reels, including paylines that are not enabled, you will then be shown a Cut-Scene. 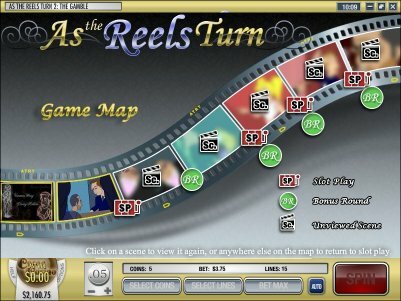 You can view the various stages in As the Reels Turn by clicking on the Game Map. There will be surprise Bonus Rounds after some of the cut-scenes. 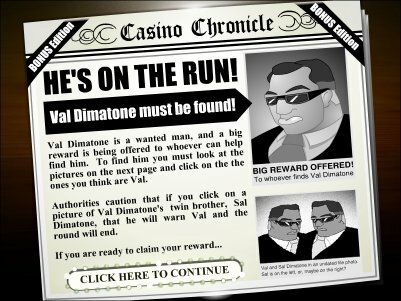 Sal and Val Bonus Round: Sal and Val Bonus Round will be triggered after the first cut-scene is viewed as shown in the Game Map. In this Bonus Round you must choose which mugshots you think are Sal. Reel of Fortune: The Reel of Fortune Bonus Round will be triggered before each cutscene in the 2nd, 3rd, and 4th rounds. Jackpot Payouts on the Reel of Fortune will increase as you progress further into the game, and new payouts will appear on the reel! When you spin the reel, it will start to slow down and you will win whatever payout is associated with the location it stops! Similar Slots: If you like As the Reels Turn 2, you might like these other Rival-powered i-slots: As the Reels Turn, Bowled Over, Cosmic Quest: Mission Control, Psychedelic Sixties, Spy Game.